Home » The Dance of the Dervishes in the Tower of the Winds. In the Tower of the Winds. THE octagonal Tower of the eight Winds, which was constructed by Andronikos Cyrrhestes, and which constituted the water-clock, the chronometer, and wealter-guide of Athens, still remains in a nearly perfect state of preservation. It is mentioned by Varro and Vitruvius, but is not noticed by Pausanias. Stuart has given ample details of its ancient as well as of its present state. This tower has been converted into a Semà-Khanés or chapel for the religious dance called Semà, which is performed every Friday within its walls by an order of dancing dervishes. The interior of the tower is covered with a wooden floor, which rests upon the lower cornice, several feet above the ancient pavement. The walls are ornamented with tablets of wood painted in various colors, and containing passages from the Quran in the Arabic character, in which language the book was originally composed. The recess or niche in the wall, which is painted with stripes of green and red, indicates the direction of the Kaaba, or oratory at Mecca. Each side of the niche contains a wax candle, before which is placed the imitation of the green flag of Muhammad. The Quran is deposited within the Mihrab. The imitation of the double-edged sword of Muhammad (Full name: Abū al-Qāsim Muḥammad ibn ʿAbd Allāh ibn ʿAbd al-Muṭṭalib ibn Hāshim) is attached to the wall. This celebrated weapon was inherited from the Prophet by the Caliph Ali (He reigned over Rashidun empire between 656 and 661). Twelve small lamps are suspended by a chain to the key-stone in the roof of the tower. Sixteen ostrich eggs, which are also suspended by a string, are supposed to be antidotal to the dreaded effects of the evil eye. The dance which is performed in the Tower of the Winds is one of the most ridiculous ceremonies of Islamism. 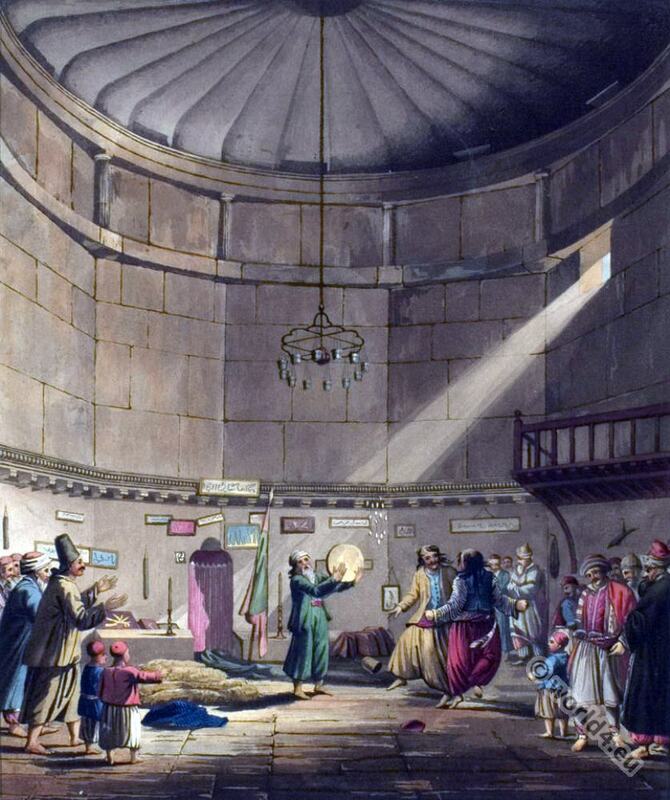 The sacred balett is opened by the dervishes, and as many Turks of all ranks and ages as like to be of the party. They first sit upon the floor in a circle, and begin by singing the praises of God and Mohamed. The only instrumental accompaniment consisted of two small kettledrums. By degrees the song increases in animation, till on a sudden the company all start up, and sing and dance in a circle with vivid alacrity and obstreperous violence. After a certain time they make way for the two principal performers, who, holding each other by the sash, turn round with incredible rapidity. The Sheikh, or chief of the dervishes, habited in the sacred green, with a large white turban, animates them by the powers of his voice and by the agitation of a large tambour. After the dervishes have continued turning and screaming for a considerable time, they at length sink into the arms of the by-standers, and are for a few minutes apparently deprived of their senses, and filled with the divine enthusiasm. This entry was posted in 1821, 19th Century, Ancient Greece, Ecclesiastical, Ottoman Empire and tagged Ecclesiastical Dress, Ottoman Empire costumes on 9/19/15 by world4.